Yesterday afternoon an Innova car hit a cycle rider near checkpost under Bhaktinagar thana. The person in the cycle died on spot said sources. And while escaping from the site the Innova engulfed another accident in which it hit a bike. 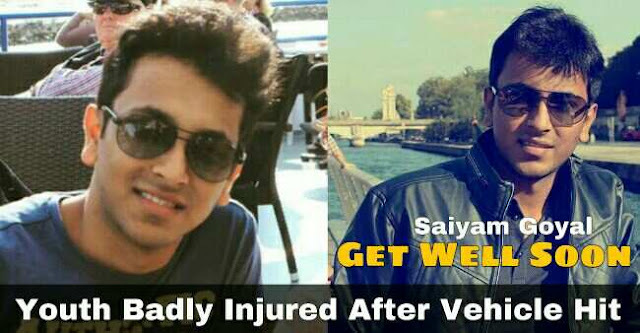 The biker, a youth from Siliguri Saiyam Goyal and his staff got badly injured. Saiyam had lost his senses due to multiple injuries, whereas his staff was in his senses. As locals came for help the staff gave them family contact numbers. Meanwhile both were loaded in a van and send to Anandloke Hospital at Sevoke Road. Sairam is critically injured and admitted in ICU. He has got several injuries in hand, mouth, jaws, liver and huge internal bleeding in lungs. Later the doctors have discovered that there are fractures in his lungs bone too. Sairam 24 years past student of DonBosco and son of Ramesh Goyal is a resident of Neel Kamal Apartment at Pranami Mandir Road, Siliguri. If anyone has any info in regards to the killer Innova please inform police or your can even contact us.